Insured and always backed by PayPal. Cool Pinstripe "TIKI HEAD" screen printed in red & white on black poly / cotton, work / garage shirt. Durable yet comfortable with that retro look and feel. Make sure you specify size in Pay-Pal notes. Cool Pinstripe design, screen printed in red & white on black poly / cotton, work / garage shirt. Durable yet comfortable with that retro look and feel. Make sure you specify size in Pay-Pal notes. 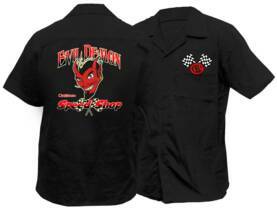 Evil Demon Devil Head, screen printed in red & cream on black poly / cotton, work / garage shirt. Durable yet comfortable with that retro look and feel. Make sure you specify size in Pay-Pal notes. 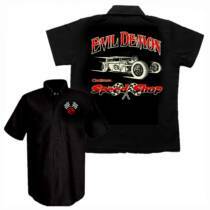 Evil Demon Speed Shop design, screen printed in red & cream on black poly / cotton, work / garage shirt. Durable yet comfortable with that retro look and feel. Make sure you specify size in Pay-Pal notes. 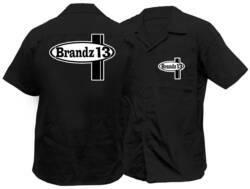 Our signature design, screen printed in white on black poly / cotton, work / garage shirt. Durable yet comfortable with that retro look and feel. Make sure you specify size in Pay-Pal notes. Brandz 13 Rat Nation Rat Rod design, screen printed in red & white on black poly / cotton, work / garage shirt. Durable yet comfortable with that retro look and feel. Make sure you specify size in Pay-Pal notes.